Does your bad credit have you worrying that you won’t be able to buy a home? Don’t despair. This handy calculator can help you determine the costs associated with becoming a homeowner. First enter a mortgage loan amount and the APR you expect for the loan. Then provide a loan term in years, as well as expected numbers for annual real estate taxes, homeowners insurance, and monthly private mortgage insurance (PMI). Press “Calculate” and you’ll receive numbers for your monthly interest and principal payment, as well as monthly taxes, insurance, and PMI payments. Click on “Create Amortization Schedule,” and a printable breakdown of your monthly payment will open in a new browser window. If you are looking to buy a new home but were told you do not qualify because you do not have good enough credit, don't take that answer as written in stone. There are things that you can do to improve your chances of qualifying for a home loan. There are also non-conventional programs that allow homebuyers to qualify with less stringent rules than a conventional loan. Here are a few ways that you may take advantage of ways to qualify for a new home, even if you have poor credit. The first step to qualifying for a mortgage is to prepare. The main reasons that a credit score is low is because either you don't have enough credit built up or you have poor credit. Pull a copy of your credit report to make sure that your credit history is correct. You will be able to tell what is stopping your credit score from being in a range that is mortgage worthy just by glancing over your report. The best way to get a copy of your report fast is through AnnualCreditReport.com. It is free and allows you to pull your report one time each year from all three major credit bureaus: Equifax, Experian, and TransUnion. 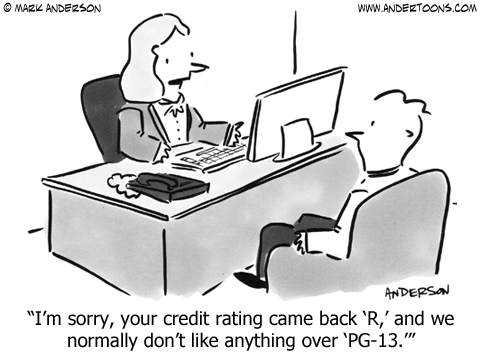 You would be surprised how many times there is derogatory information on a credit report that is false. Look for paid items that show delinquent and defaults on credit cards that you did not take out. If you owned a home and applied for Home Affordable Modification Program (HAMP) since the government program launched in 2009, look for foreclosures and loan modifications that did not take place. If you do have wrong information included in your credit report, the FCRA (Fair Credit Reporting Act) has steps that you can take to remove false information from your credit history. If you indeed have bad credit or not enough credit, both instances can be corrected so that you qualify for a mortgage. If you went through a period in the past few years where you were unable to make all your payments on time, you probably have poor credit. The good news is that once that bad period is over, you can begin rebuilding. Whether you are rebuilding credit or building credit for the first time, you need to prove to lenders that you are worthy of their credit. All conventional mortgage lenders use Freddie Mac or Fannie Mae guidelines when approving someone for a mortgage. You must have a credit score of at least 650 to qualify for a mortgage underwritten by Freddie and Fannie. If you are willing to look at a non-conventional loan, the Federal Housing Administration (FHA) has less stringent guidelines and only requires a credit score of 580. Take out a credit card and never be late with payments. Pay even more than the minimum if possible. Make sure that all credit card balances are under 50 percent of the credit line. Some experts recommend to not have a balance above 20 percent. Do not apply for several credit cards or loans in a short period. Inquiries show on your credit report for several months and will bring your credit score down. Pay off small balances on cards, and stop using them. Use only one card to make purchases, but do not cancel the other cards. Canceling cards can hurt your score. Once your credit score is within 650, you are ready to begin mortgage shopping. Since the mortgage crisis of 2008, qualifying for a mortgage has become tougher. Added to the stringent guidelines is the fact that many people, who had great credit prior to 2009, filed bankruptcy after the recession. If you are one of those people, all is not lost on qualifying for a mortgage. Depending on what type of bankruptcy that you filed, you can qualify for a mortgage after meeting certain criteria. First, your bankruptcy must be discharged. There is a difference in a discharged and dismissed bankruptcy. A dismissal means that your debt is owed and not forgiven. If you have a dismissal, you do not qualify for a mortgage. A discharge and close means that you have fulfilled all the obligations under the bankruptcy rules, and you may now begin rebuilding credit. If you filed a Chapter 7 bankruptcy, the bankruptcy would stay on your credit for about 10 years. However, you can apply for a conventional loan four years after the discharge of a bankruptcy. If you wish to apply for an FHA loan, the wait is two years from the time of discharge and close. If you filed a Chapter 13, the wait is not as long. For a conventional loan, the bankruptcy wait is two years. For an FHA loan, the wait is only a year. Both timeframes are from the date of discharge. On a Chapter 13, you must pay into the plan for a minimum of three years. That means that you filed a Chapter 13 at least three years before your discharge date. In both cases, the wait time is around four years from the time that you filed for bankruptcy. If you had a foreclosure or a short sale on a previous property, the wait is the same. You may apply four years after the closing for a conventional loan or two years after the sale closes with an FHA loan. Once you have your credit score within the desired range, you will most likely be approved for a loan. But the interest rates and other fees may be high if you do not qualify with a high FICO credit score and can't prove steady income over the past two years. To overcome these barriers and be approved for a better rate, try to save as much as you can for a down-payment, and have an extra two to three months of an emergency fund in your savings account. For a conventional loan, you are required to put 20 percent down to avoid PMI (Private Mortgage Insurance). With a less than perfect credit score, not having a full 20 percent can result in a higher interest rate. Even a rate one-half percent higher than the average can mean additional thousands over the life of the loan. The reality is that most homebuyers are not able to save a full 20 percent and have an emergency fund unless they are willing to wait a long time to buy that house. For these homebuyers, there are programs that require less money down and may be the answer to your prayers. These loans consist of FHA loans, VA loans, and USDA loans. There are also even more non-traditional loans such as land contracts and loan assumptions. An FHA loan requires that the homebuyer put down 3.5 percent of the purchase price. That means for a $100,000 home loan, you would only need $3,500. Sounds good, right? Why wouldn't everyone go for an FHA loan? Well, where there are pros, there are always cons. With an FHA loan, you can never get rid of PMI. PMI will run an average of $40 a month for the life of the loan. Also, you will pay more interest on a $100,000 FHA loan than you would a conventional loan because your loan amount will be higher. However, FHA loans are designed for people with less than perfect credit, and their interest rates are lower than conventional loans. They also have more stringent guidelines for the seller, so not all properties can be FHA approved. For example, historic homes often do not qualify because they lack handrails and contain lead-based paint. Unless the seller is willing to correct items for FHA approval, you cannot fund via FHA. If you qualify for a VA loan, they require a smaller amount down and require no PMI. To qualify for a VA loan, you must have served in the military. There are also specific guidelines to qualify for a USDA loan, but if you are looking to purchase in a rural area, they are worth looking into for financing. Contact a mortgage company for the specific guidelines. Land contracts are private sales. You are buying directly from the seller on a type of rent-to-own contract. If you are considering a land contract, talk to an attorney. These can be risky transactions for both the buyer and the seller. If you are a first-time homebuyer, looking into the first-time home buyer program HOPE is worth it. They can help low-income individuals who would ordinarily not qualify for a mortgage. Now that you understand more about building your credit back up and qualifying for different types of loans, you are ready to begin taking the steps to qualify for that mortgage. There are a lot of great programs out there that can help you understand the variables even further. Contact the people at HomeFreeUSA for even more information about mortgage help for people with less than perfect credit.